'Boring' Singapore City Photo: Short-sighted? Do you know you can still be a fighter pilot??!! Short-sighted? Do you know you can still be a fighter pilot??!! 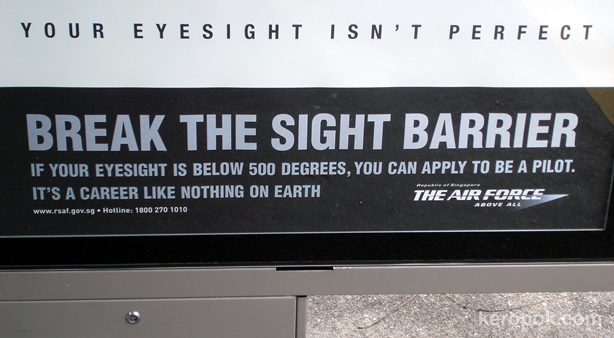 Do you know that you can still be a pilot if you are short-sighted till 499 degrees? 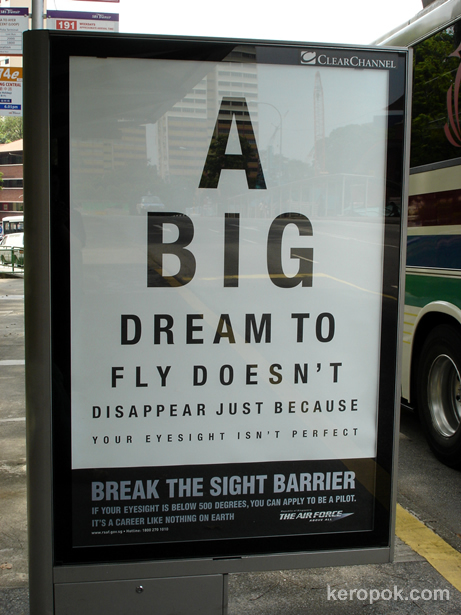 This was someone that I discovered when I saw this billboard at the bus stop. Colleague said that they will send you for lasik. Is it true? Interesting - great advert though. Very eye catching. Interesting pictures. Very eye-catching images. i'm getting into some trouble with that! I have 2.5 dyopter in my left eye but in the right one it reaches until 9 dyopters!! God save my contact lents! yes, i heard the same thing...they will send you for lasik...so good hor...think FOC....:O ? me cannot, both eye, each above 500deg liow! Computer Science is Totally Happening! High Rise all belongs to banks? A duck that behaves like a bus and a boat. How To Make People Like You in 90 seconds. Singapore Fashion Festival starts next week! Ouch! Huge heels stepped on my foot! Rubbing Shoulders with Strangers at the IT Show. Open House Day for NUS, NTU and SMU. How many mops does it take to do the job?